​Using a regular comb on your beard is one of the most common beard grooming mistake﻿﻿﻿s you can ever make. 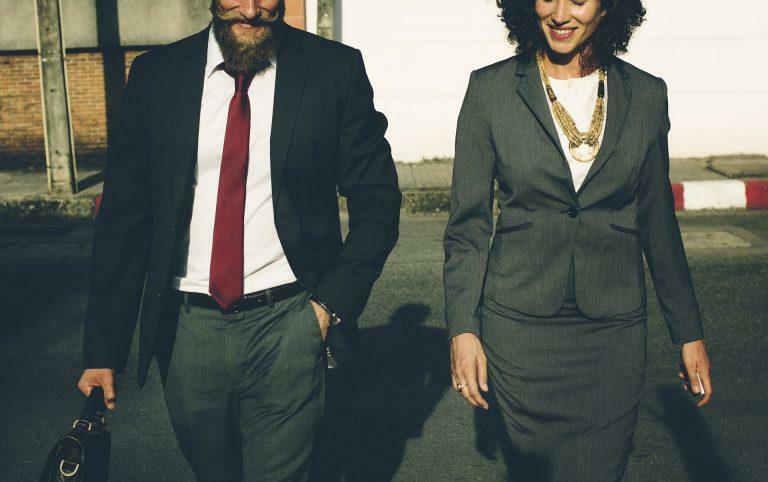 It might seem like a very insignificant thing, but using a cheap, regular hair comb on your beard can cause lasting damage to your facial hair. At this point, you are probably wondering what the big deal is, since all combs look pretty much alike, right? Wrong, because appearances can be deceptive. Look closer, and you will see small but significant differences between ordinary hair combs and a beard comb, and as they say, the devil is in the details. These little factors can make the difference between a magnificent beard and weak and scraggly looking mass of fuzz on your face. So if you want to keep that manly beard looking healthy and fashionable, a proper beard comb is an essential part of your bread grooming kit. What Is A Beard Comb? 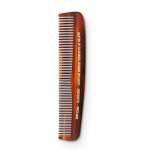 Why Should I Not Use An Ordinary Hair Comb On My Beard? What Is The Difference Between Beard Combs And Beard Brushes? How Often Do I Need To Use Beard Combs? How Do I Select The Best Beard Comb? ​A beard comb is a basic grooming and styling accessory for your beard. They are usually handmade and can be found in many different sizes and shapes. The most popular beard combs tend to be made of wood, though other materials like animal bone and horns are also very popular. You can even find metallic options, made from high-quality stainless steel. And in price, they can range from incredibly cheap (for plastic combs) to ridiculously expensive, for the more elaborately carved combs made from high-quality wood or bones/horns. They are perfect for grooming and cleaning your beard, and ensuring that tight knots do not form. ​If you want to maintain your beard in a particular shape or style, you just can't do without a beard comb. The individual hairs on your beard have a different quality and texture when compared to the hair on your head. And beards tend to have more knots and tangles, especially as they start to get longer. Ordinary hair combs have thinner gaps between their teeth, raising the chances damage to your beard haur follicles. Use them with too much force on your knots, and you can say goodbye to clumps of your beard hairs, as these combs can literally rip them out by their roots! It is hard to find a hair comb with the optimum width between their teeth. Use one with too wide gaps, and you will not be able to properly style your beard. Even more worryingly, those low-quality plastic hair combs may have microscopic serrated/jagged edges on their teeth, which can cause your beard hair to tear apart along their length every time you run these combs through your beard. And let's not forget how often the teeth of cheap combs break off. These broken edges can also cause further damage to your beard. For the safety and health of your beard, using is a high-quality beard comb is recommended. Both are essential instruments in a modern beard grooming kit. Though there is some minor overlap between their functions, you really cannot substitute one for the other. A beard brush, commonly crafted using boar ﻿﻿﻿hairs, is best used to groom and clean your beard after washing and oiling. The boar hair bristles absorb the excess oil and ensure that all parts of your beard get equal amounts of oil. It helps give your beard more volume, with that "puffed up" look. 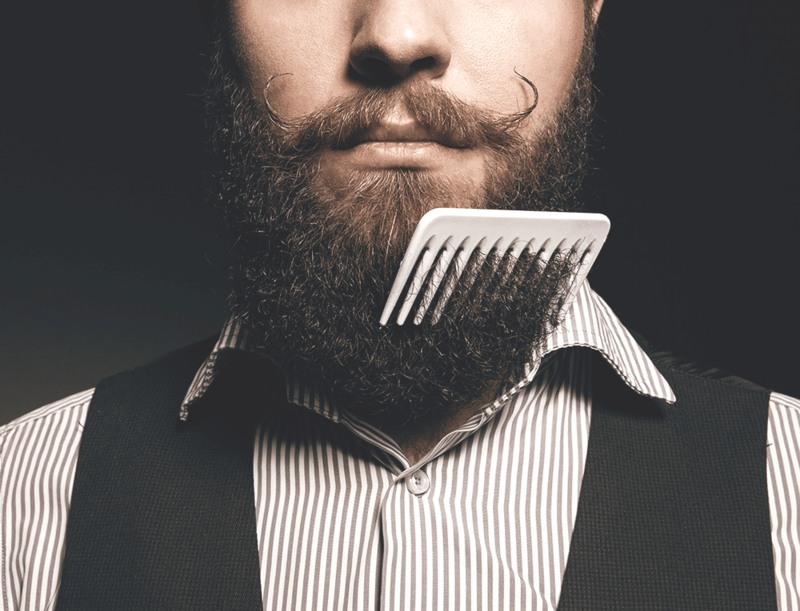 A beard comb is more of a styling and restyling tool used to maintain the shape of your beard. If you feel that your beard is losing its shape halfway through the day, a beard comb is what you would pick to tidy up. Ideally, you should have both a brush and comb for the perfect looking beard, all through the day. A lot of that is down to the ﻿﻿type ﻿﻿of beard you have, how stiff your whiskers are, and how well they stay in place for particular styles. But no matter how fine or thick you beard hairs are, and how intricate the style is going to be, there is a fine line between proper maintenance and over-maintenance. 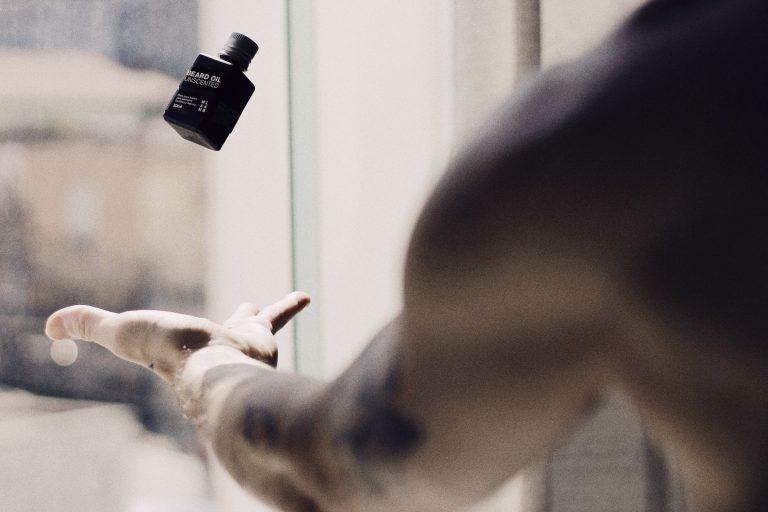 These days, ​when it comes to beard grooming products like ﻿oil ﻿and shampoo, one often see manufacturers suggesting that you apply their products as often as possible, several times a day even. This is obviously a marketing spiel to encourage you to use more and buy the products more often. Overuse can lead to adverse effects, and the same is true for beard brushes though not as much for combs. Running a brush too often through your beard may eventually leading to the follicle being pulled out, and can cause split ends. Use all grooming products sparingly, maybe once a day or once every other day for best results. Combs though, can be used multiple times a day, as log as you use one that has the ideal width for your hair type. As for shampoos, oils, and balms, overuse can affect the natural oil (sebum) balance adversely. This will influence the health of your beard in the long run. So less is more as far as these things are concerned. Always insist on durability and quality when shopping for beard comb. The cheaper the comb the more harmful it can be to your beard. Avoid cheap combs as much as you can if you want to benefit from ​them. Cheap combs break easily which means you’ll not use them for long. This will force you to buy a new comb every time it breaks. 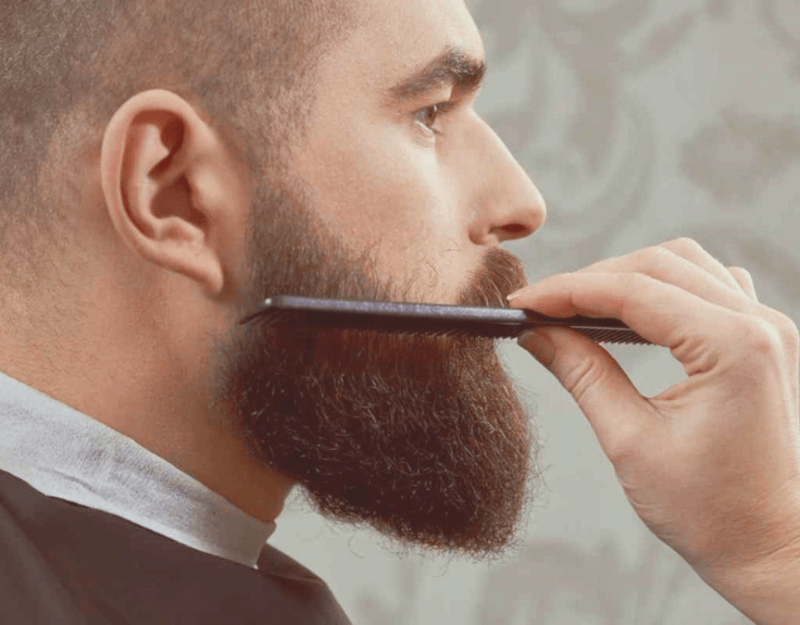 If ​​it breaks while combing, it can split beard ends which will affect uniformity and growth of your beard. Cheap and low quality beard combs can also pull your hair right from its root ​. Your beard will gift you by growing in the right manner only if you use quality comb. This is also a very important factor to consider. Look for extra attachments. These attachments are usually recommended because they help achieve symmetrical, clean and perfect beard. Normal size combs are those that are best used at home, while the more compact pocket-sized version can be carried along when you go out. Folding beard combs offer another flexible option if you want a full sized comb that can be carried around in your pocket. For an even smaller size, you can try mustache combs, which also provide more precision when styling fine hairs. Wood is a popular choice because it is affordable, doesn't produce static electricity, ​and looks very rugged and cool as well. But they don't like humidity and should not be washed with water, so cleaning one can be a bit of a hassle, especially if you use a lot of oil/balms. Sandalwood and pear wood are popular choices. Horns make the best beard comb, because of their extreme smoothness, and the toughness of the material. And they produce no static as well. On the downside, they tend to be very expensive and is not an option if you insist on buying vegan stuff. Plastic combs are very cheap, but that is probably the only thing positive about them. Cellulose acetate combs resemble plastic but are in fact made of a superior raw material that gives a user experience comparable to horn based combs, regarding smoothness and sturdiness. Metals combs score highly when it comes to durability, but produce a lot of static electricity. If you struggle a lot with taming your beard hairs, these combs can make an already tough job even harder. But otherwise, they offer an excellent mid-tier option. ​Stamp Press vs. Hand Cut: We have already addressed the concerns about cheap plastic combs. These combs are made using stamp press method. Other combs like wooden and horn based combs are made using the hand cut process, which yields a safer comb with much smoother teeth. How do you ​Benefit by ​Combing your ​Beard? Before we learn some of the basics of combing your beard and ensuring that it’s clean all day let’s look at advantages of combing. As long you use ​a quality comb ​it ensures that oil is spread evenly across the beard. ​A lot of times hair grow in several directions, especially if you have ​curly hair hair, and this can lead to ingrown hair. By combing your beard on a daily basis you guide these hair to grow in ​the right direction preventing ingrown hair. People who do not use beard combs sometimes struggle with hair that grows over the mouth. Combing your beard regularly is the best way to prevent food particles from getting into contact with your beard. If you want your beard to grow nicely around your face you should comb it regularly. Well combed beard always makes a statement and the hair learns to grow in the right direction. Beard combing is a technique. Combing your head and combing the beard are completely different things. If you want your beard to turn heads every time you are out there then you need to learn how experts comb their beard. Here is a quick kickass video to get you started. The teeth of your beard comb should be wide enough for it to glide easily through the beard. When combing your hair, do not forget that your mustache also needs to be done. So as much as ​you need a comb ​with wide teeth ​you also ​need small teeth to comb the moustache easily. You can always use your favorite moisturizer in order to prevent hair pulling. Hopefully you always comb your beard after a shower. The process is simple. Just start from the lower end of your beard and comb upwards. Your comb should face up. Start from the neck and comb upwards where the beard ends. While combing your hair upwards or downwards you’re likely to encounter snags. If you find snags avoid pulling the comb because this might damage your hair. If you hit a snag just remove the comb and start all over again. Beard hair does not form complicated snags that can resist combing. You can comb through snags easily by using oil every time you comb your beard. After combing upwards you should start the downward process. This is known as the styling process. It allows you to comb it in a way that you want. If your beard is fully grown it’s always easy to comb it downwards. While doing this, you should also comb the mustache to prevent hair from covering your mouth. Be gentle while combing your beard and when you hit snags. If you realize that your beard is a bit tough you can apply beard oil to make it easy for the comb to glide easily. ​​The soothing scent of sandalwood makes this a unique option. ​​The wooden comb helps avoid any issues related to static electricity. ​​Can be used for both your hair as well as the beard. ​​Some beard hairs may get pulled by the bristles/teeth, and they are a bit coarse. ​​​Wooden combs are not easy to wash and clean and require a bit more care. ​​The folding feature has some minor niggles. ​No matter the size of your beard, this comb will easily glide through your beard upwards and downwards. Good things are usually come in small sizes. Striking Viking folding wooden comb is a versatile and easily portable comb you can use anywhere. It comes with a strong grip that makes you comb through your beard in a gentle manner anytime. ​Pocket combs are easy to carry, but they often lack a proper handle. 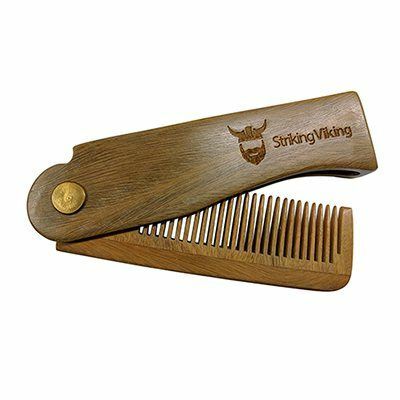 A folding comb offers a way out, and this wooden folding comb from Striking Viking is a very "striking" option indeed. It ticks all the right boxes for those who need a macho, portable comb for their beard grooming and styling needs. The laser etched brand name and logo look very cool. The comb is made from natural sandalwood, and the comb has a very pleasant natural fragrance. The bristles are well spaced and can be used to groom all kinds of beard hairs. ​​​All-natural wooden combs, with no chemicals used in the polishing process. ​​​Handcrafted from Pear wood, so each comb is a unique piece. ​​​No issues related to static electricity. ​​​Compact and easy to carry around in your pocket. ​​​The comb is not a uni-body construction, the two smaller combs on the side are glued to the main body. The glue may weaken with humidity. ​​​​Doesn't work very well for men with finer hair in their beards. ​​​The overall finish is not very durable. If versatility is a factor you always consider when using a comb then this is the best pick for a person like you. this beard comb comes with differently sized teeth that will not only glide through your beard perfectly but your mustache too. 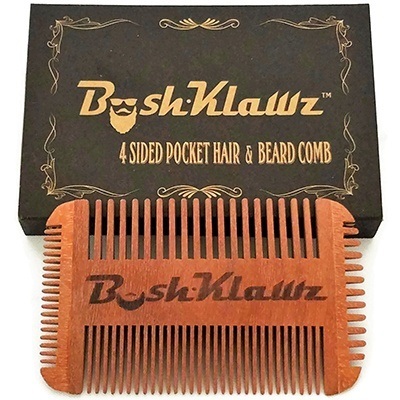 4Klawz beard comb designers had users in mind while designing this beard com​b. It’s made from strong wood to last. Differently sized teeth provide the user with different options when combing. It’s perfectly finished for easy holding while combing your beard. ​Buying a beard comb with just one set of teeth is a bit of a risky proposition. What if the width of the bristles don't suit your particular hair type? If you have this concern, 4Klawz may have the ultimate beard and mustache combing solution for you. This is a square shaped comb with not one, not two, but four different set of teeth on its four sides. Each set is unique, with different lengths and width between the bristles. So you can use this one comb for your beard, mustache, sideburns and probably even your hair. ​​​​One of the most durable and sturdiest options in our list. ​​​​Ideal for use with razors and trimmers. ​​​​Uni-body construction and high-quality finish help the bristles glide through your beard. ​​​​Perfect for shaping your beard. ​​​​Though quite compact, this is not a comb you would want to carry around in your pocket. ​​​​​May bring issues related to static electricity, especially if you have longer beards. ​​​​The unique shape makes it rather unwieldy, might take some time to get used to. Glides softly through any beard size. This comb makes styling your beard very easy. Because of the material it’s made from (stainless steel) it will not retain oil or moisturizer. 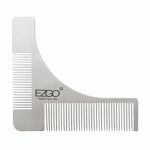 If you always want a comb that will give you a professional and sharp look after combing your beard then look no further than EZGO stainless steel beard styling and shaping comb. EZGO stainless steel beard styling and shaping comb was built for men looking for a comb that will serve them comfortably and for long. ​If you don't have too much of styling to worry about, a metal comb is not a bad option at all. They are more durable and easier to wash and clean. Stainless steel combs like the EZGO model are especially good if you use a lot of beard oil and balms on your hair. This particular model has an "L" shaped design with two combs on each side. Metal combs are great when combined with a razor or electric trimmer. The combination of two different combs in an innovative shape is ideal for working with all sides of your face. ​​​​​High-quality handmade comb, made with superior cellulose acetate. ​​​​​The teeth do a great job in all kinds of hair, with minimal static. ​​​​​Pretty easy to clean and can be used with beard oils and balms. ​​​​​The teeth of this comb are some of the best we have come across, smooth and well rounded. ​​​​​Not the best looking model, resembles cheap plastic. ​​​​​​May not work very well with really long beards. ​​​​​Some men may find the comb a bit too small to handle properly. This is a very deceptive comb because of several reasons. For starters, it is called Baxter of California, but the combs are handmade in Switzerland! And looks wise, it resembles a regular plastic comb but is in fact made from high-quality cellulose acetate sheets, using a unique 12-stage manufacturing process. As a result, all the teeth are smooth and have well-rounded tips, to provide optimum care and comfort for your beard and skin. It is a single long comb, with two sets of teeth with different spacing. So there are multiple options to handle different types of beard hairs. This is an easily portable type of a comb that you can always carry and comb your hair on the go. 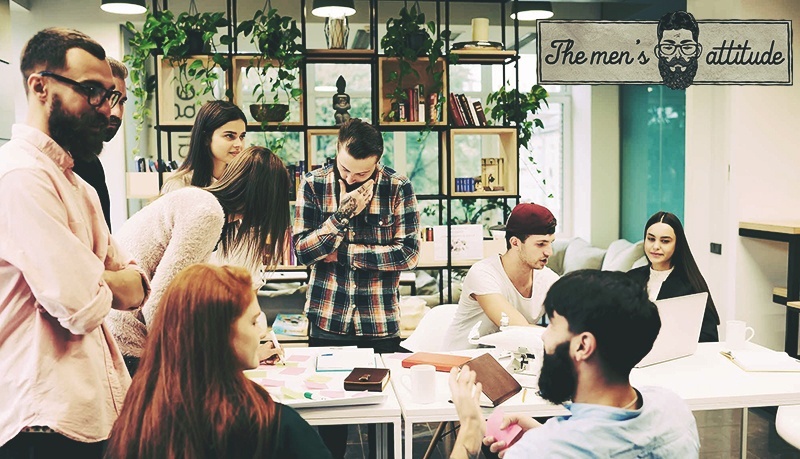 It’s ideal for both starters and professionals in the world of keeping beards. Because of its small size, this comb is a good option to be used in sideburns, mustache and beards. Because of the material that it’s made from, Baxter of California Men’s beard comb is ideal for all bearded men looking for a comb that will always be a good friend to serve them as long as the beards need the service. ​​​​​​Simply one of the best in terms of looks, dark and stylish. ​​​​​​Comes with a genuine leather sheath that looks fantastic and protects the comb. ​​​​​​The teeth and handcrafted using the saw cut method, resulting in rounded tips that glide through your beard. ​​​​​​Made from natural horn, this is a very sturdy comb that you can carry around in your pocket. ​​​​​​Not suitable if you are vegan or have concerns about using animal products. ​​​​​​​A bit more expensive when compared to some other products we have reviewed. ​To round off our list, we have a comb made from a material we have not covered yet in our reviews: animal horn. The animal in question here is Buffalo, and this comb is hands down one of the coolest we have ever seen, even better than the Striking Viking models. Animal horn is one of the best raw materials for combs since they are made of keratin, the same protein that is found in out hair. And they are second only to metal regarding durability. 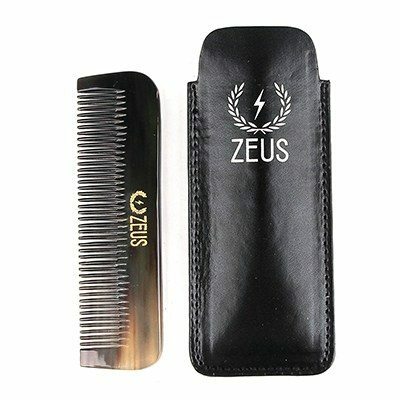 This Zeus comb is quite compact and has a medium set of teeth that could work with many different types of beards. ​As you may have no doubt noted, we have tried to include combs made of different materials in our short review list. And yes, we have left out cheap plastic for the reasons mentioned in the buying guide. If we had to pick a winner out of these five combs, it would surely have to be the Zeus Natural Horn Beard Comb. 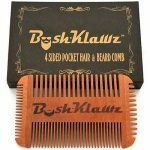 It looks great, works flawlessly with a wide variety of beard styles and types, and is durable and easy to carry around. It even comes with a genuine leather sheath. There hardly anything to criticize about this comb. But if you have reasons not to buy a comb made from animal parts, we suggest the sandalwood comb from Striking Viking as the second best option.